In the words of front man Louis Abbott, “I think the times we live in can get you down, and the way to deal with this is to do what you love – and right now, we love making music together and playing it to people.” The sophomore album from Admiral Fallow is comprised of ten tracks that house an array of lyrical themes. From war violence to family, regrets to the greatest bar in Glasgow, Tree Bursts In Snow covers it all. 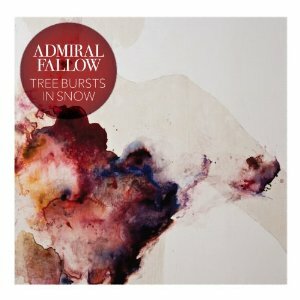 Admiral Fallow’s sound softly swells like the ebb and flow of the tides on “Burn.” As the most orchestral track on the album, the string arrangement and bass clarinet line work to further define the lyrics. Immediately following – and completing the album – is “Oh, Oscar.” The character singing is reflecting upon his recent success, and he questions if it is what he truly wants. Referencing the album title while being accompanied by Kevin Brolly’s poignant clarinet, the track sweetly yet sorrowfully brings this adventure to a close.